We don’t know where the yarnspinners came from, nor exactly when they came. It wouldn’t help anyway as they are so adept at camouflage. I don’t mean just their appearance, but even in this we cannot be sure, but the ability to warp truth. Imagine you knew they arrived on a precise date, the fact would be specious because this is exactly what they do; distort things, by infiltrating and undermining our cognition. And so their appearance is deceiving too. 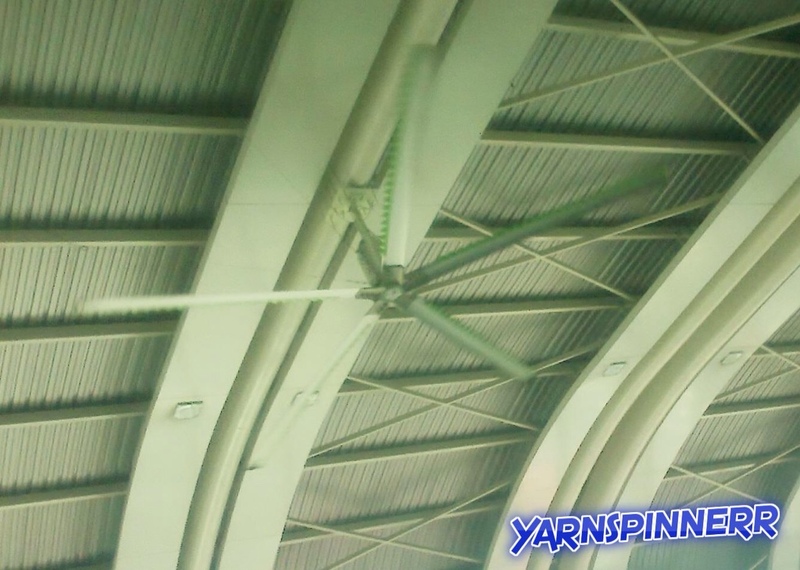 Do you remember the roof fan being there yesterday? This week’s Flash Fiction story for Flash Fiction For Aspiring Writers was inspired by the picture on the left, and kindly provided by Yarnspinnerr. As you can see, the story is as much inspired by our photo provider’s name as it was the photo, so thanks twice over. The rules for FFFAW are all explained HERE or click on the black box right, or on the blue FROG button below to read other stories submitted. It’s a corker and by far the best one I’ve seen posted. I do like a philosophical teaser. As someone interested in what I cook and eat – a bit of a foodie – I’m also interested in the question. Should we eat meat? The vegan position goes a lot further: no use or abuse of any animal products. I see in some quarters this includes honey, the food bees make for themselves to eat from robbing our flowers of their nectar and pollen. The liberty! I’m willing to listen to the argument around sentient pain and suffering but not yet about the immorality of stealing food from insects. The strategy of the vegan movement – and it does look like a movement, not simply a lifestyle choice for many – is to shame and cause guilt. They are emotional and angry. They have woken up to the fact that animals suffer and die for our food, and it’s upsetting. What they are up against is a long and continuous culture of meat eating and animal husbandry doubtless going right back through prehistory. It is biological and probably assisted greatly in human evolution. In modern life, meat is a tradition upheld throughout most of the world, it is a right and often expected. The fact that it is possible, with careful planning of meals, to survive on a strictly vegan diet is not a persuasive enough argument in the face of such an ingrained culture. I dare say the vast majority of meat eaters don’t care, a good number don’t so much as care how their food gets on the plate as it is. I’m not sure I’m ready for veganism just yet. It’s too difficult and I’d miss the tradition of having the full diet and sharing food with others. The thing is, has veganism changed the game; does it make any sense to become just a vegetarian now? There are some dubious arguments about health benefits but none proven. In any case, just cutting down on meat is sufficiently beneficial, something I’ve been doing anyway because I’m interested in food and some dishes don’t require meat. But eating vegetarian meals, even often, doesn’t make you a vegetarian. Yet the reasons for going veggie now seem outgunned by the reasons for going vegan. 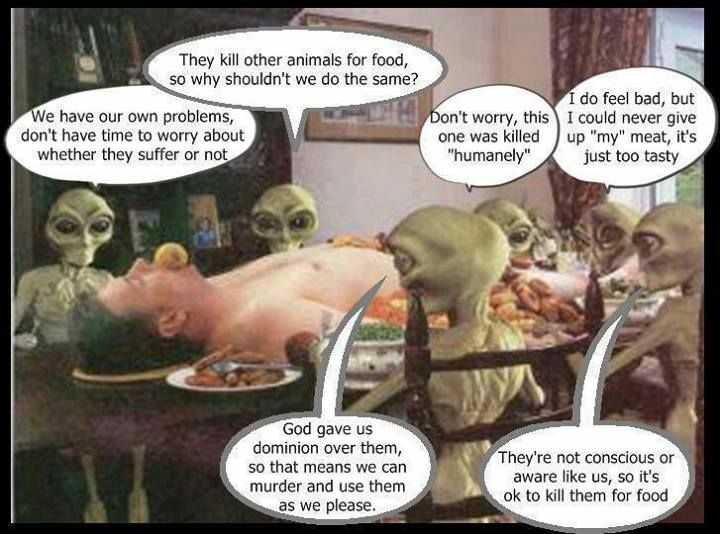 So, what about our superior aliens coming here and eating us? Do we let them? Quora – Should Aliens eat us?